As we prepare for the 6th Annual Emmanuel House/Bryan House silent auction, Nov. 16, 2012, here’s a story about the very first auction—when we referred to it as the Promise Fair. Bryan Guzman’s family senses his presence often these days. The 21-year-old North Central College student and Naperville resident drowned in Lake Michigan last December in an apparent freak accident. Today his oldest brother, Rick, says Bryan’s spirit lives on as he and his wife, Desiree, put together plans for a benefit this weekend that will support their work toward a sanctuary bearing the late young man’s name. The inaugural Bryan House Promise Fair will supplement the funds the couple has collected during previous fund raisers to help them purchase a home that will accommodate refugees of war or persecution who find their way to the Aurora area. Through their nonprofit, the Tolbert Refugee Assistance Foundation, the couple expect ultimately to help more than 100 families by giving them temporary accommodations while they save up to buy houses of their own. It’s another step toward the realization of a drean that began when Bryan was still among his loved ones. His brother believed in the cause, he said, sometimes kicking in $50 donations despite being “a poor college student,” and he sponsored international orphans on his own. Plans for the fair include music, performed by Bryan’s brother Dan and local gospel artist Renea Taylor, as well as an enormous yard sale, auctions and a marketplace offering the wares of several home-based vendors representing companies such as Avon and Tastefully Simple, who will donate all of their proceeds to the event. A massage tent, sponsored by the School of Holistic Massage and Reflexology, also will be featured. There has been a catharsis in laying the foundation for Bryan House, which will be flanked by a garden as a living memorial to its namesake. 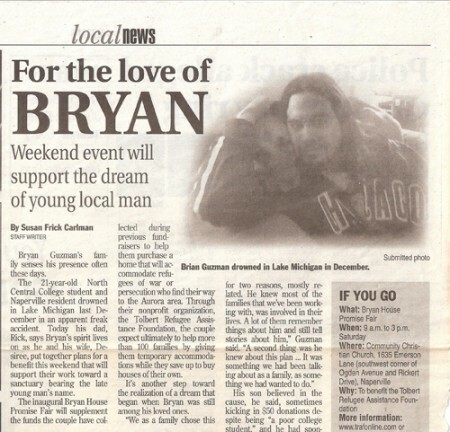 The article as it appeared in The Naperville Sun, June 22, 2007. Go to the Emmanuel House/Bryan House main page. Read about the 6th Annual Silent Auction. This entry was posted in Family, Social Change and tagged Bryan Guzman, Bryan House, Emmanuel House, Rick Guzman. Bookmark the permalink.